There’s so much marketing jargon out there that it’s sometimes hard to figure out what matters and what’s a waste of time. 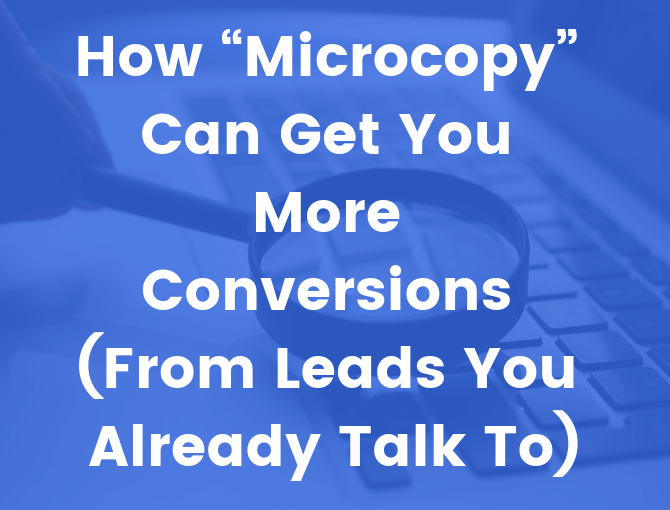 When you hear the word “microcopy,” your first instinct might be to roll your eyes at yet another mystery marketing term. Any time you sign up for a new account, make a purchase, subscribe to a list, or interact with a company online in anyway, you like to know what you’re getting yourself into. You want it literally spelled out. That’s what microcopy is for. And, if you do it well, you could get more people to sign up for what you’re offering. What the heck is microcopy, and why should you care? Microcopy is any small bit of copy that increases customer usability by addressing concerns, clarifying next steps, or convincing customers to take action. Basically, it’s all of those little captions below buttons, on buttons, or next to form fields that provide background information to different customer interactions online. Not only will microcopy encourage new visitors to take action, it will also help convince your warm leads to finally take those steps they’ve been hesitant to take before. So, why is microcopy important? Provide transparency (No one wants to deal with Charlie Brown’s teacher). All of these goals work together to reduce friction along the customer journey. Don't get reassured. Be anxious. Lack transparency. But do put in your email below to get one email (with our best marketing advice) each week. Microcopy reduces friction along the customer journey. Fantastic! But, how specifically does it do that? Imagine you are out hiking in the mountains. You’ve been given a map, water, and other resources you need to successfully complete your journey. Ok, great. The trail guides have thoughtfully included a note to make sure you don’t do anything dangerous that would prevent your successful hike completion. BUT, you know what might be nice to also know? Why they want you to proceed with caution. Where’s the fine print? Where’s the context? For all you know, you could be heading to the edge of a high cliff, or into an area known for poison ivy. That sign really could have used some microcopy, which is why call-to-action copy often does. Is there is going to be required credit card info, or will you have to include your phone number? And, why do they need those things? Context truly is key for a good user experience. 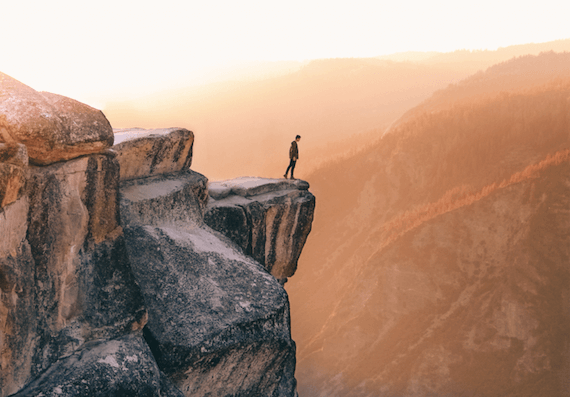 If that hiking trail sign instead said, “Proceed with Caution (Steep cliff 100 feet in),” then you can take action by forging ahead with all the necessary information, successfully completing your journey and maybe coming back to hike another day. Microcopy probably would have helped about 100 ft ago. If something sounds hard, fewer people are going to do it. Microcopy can help you make things sound easy. Which button sounds easier to you? Whenever possible, avoid making the next step of the process sound more difficult than it is. In this example, “get your free webinar” is probably the best copy. You have the right to know what you’re signing up for, and microcopy makes sure that you do by alleviates all types of customer concerns. What might those concerns be, you wonder? Getting spammed by you or other companies. As microcopy writers, it’s our responsibility to look at the whole picture at the end of the puzzle, not just pieces. 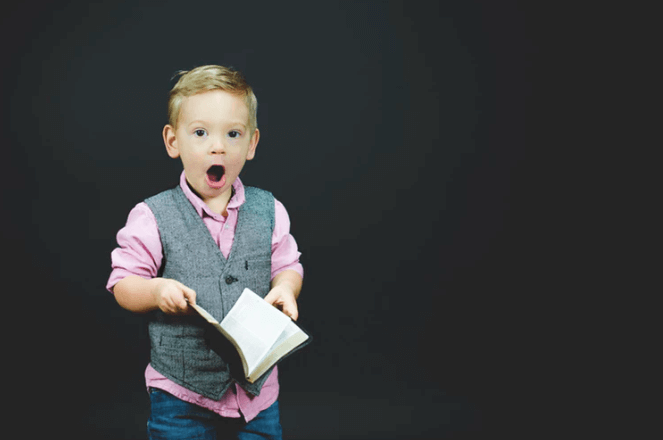 We have to make sure that customers aren’t being surprised along the way, and microcopy takes away that unwanted surprise. Avoid causing this face. Not everyone is fond of surprises. This line of microcopy is simple, straight, and to the point. Imagine this copy below the “Sign Up Now” button. “Sign Up Now” is pretty ambiguous, and it doesn’t really tell you what comes with that sign up later. This microcopy’s subtext says “no commitment,” takes away that uncertainty, and prompts a customer to keep clicking through the process. Remember before, when we listed data security as one of the customer concerns? Microcopy like this is how that concern is addressed. 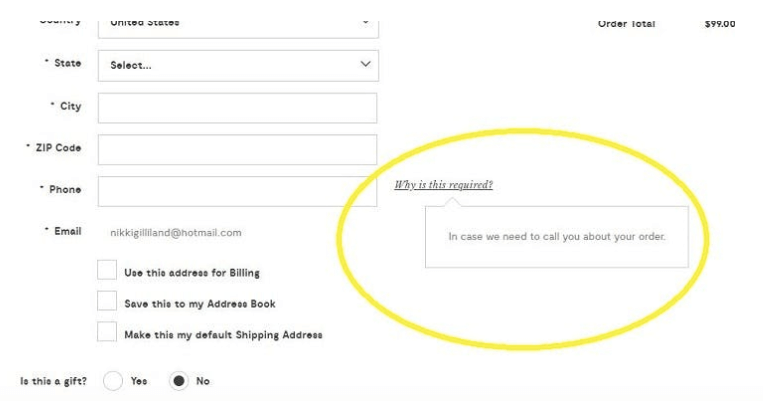 If the example button were on a form that a customer was filling out with required, personal information, microcopy that explicitly ensures privacy and not allowing any spam will go a long way in that future customer relationship. While it’s a nice gesture to reassure customers about something they wouldn’t want to happen, be careful when using the concept of spam in microcopy. They might not have even thought about the possibility of being spammed, so don’t inspire them to. Using other language to describe it or making sure it makes the most sense in context could be helpful. When a customer is signing up for a new account, it’s comforting to know that they don’t have to make all of their decisions right away. Want to change an address or the name in an account? Great. This microcopy that makes it clear they can. No strings attached, no hassle, no financial commitments, no headaches. This microcopy assuages multiple concerns in just one line. Microcopy like this makes clicking a button that says “Sign Up Now” a whole lot easier. Who doesn’t jump at the opportunity for free stuff? Nothing says “let’s move forward” to a customer you want to finish an action than literally saying that action won’t cost them a thing. This says they get something that will benefit them, and that there’s no work to get it. Win-win for everyone involved. 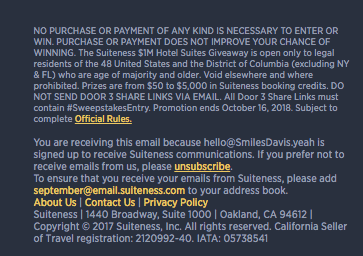 Do you ever read all of the fine print on a privacy agreement or every rule and regulation for an online contest entry form? Probably not, because they typically go on forever, and you have a life. So, don’t make your customers do it. 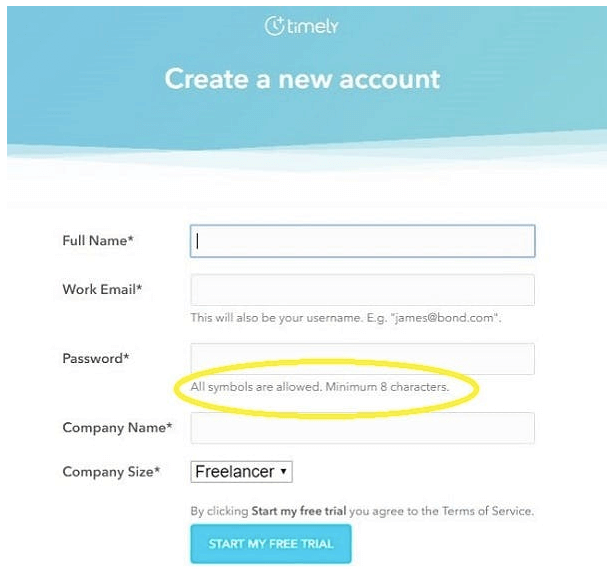 Although lengthier microcopy is sometimes necessary (like terms and conditions), it’s best to strive for making your point in as few words as possible. Also, don’t make those words burdensome laborious hard to understand. When we talk about content, including microcopy, we talk about keeping the language simple, human, like you’re actually talking to someone. Yeah. Nobody has the time for that. People reading your content are likely to be content scanners who only want a short and simple line that tells them everything they need to know at that moment. Most people scroll through 50-60% of online content. Another 1997 Nielsen study found that short, scannable writing improved usability by a whopping 124%. 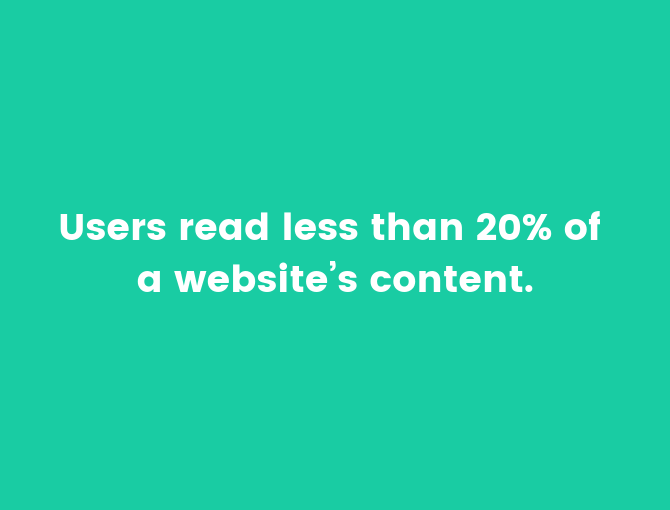 Only 20% of an entire website’s content? Better make it count. So, why is this important to know for microcopy? Scanners are literally scanning copy for the main points, or for something specific they are looking for that brought them there in the first place. Scanners are more looking for the gist that gets simply and straight to the point. Microcopy lets you get that fine print in front of people’s eyes without always going on forever. It can give your leads and conversions a boost, but only when done right. To get it right, there are 4 rules to keep in mind when you’re creating microcopy. Remember those examples before of microcopy in action, alleviating customer friction? Following these 4 rules are why they were successful. “Keep it short and sweet.” It’s a common expression for a reason, and it definitely applies to microcopy. In a content scanners world, you don’t want to be overly wordy or use high-brow language. If you can be creative while being clear, great! But the most important thing is to get your message across with the first read. Microcopy shouldn’t be a novel, but that doesn’t mean it can’t be a few lines if necessary. 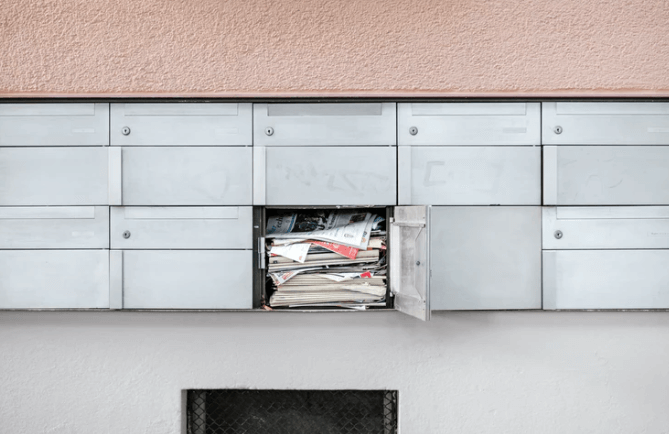 Context is an important and helpful component to help leads become customers, so don’t feel constrained by trying to keep microcopy short every time. No customer will blindly give their information. They want to know what they are getting themselves into and what you’ll do with their information, so strive for transparency and make sure they have all necessary information at each step of their process. Creative copy is cool, but not if it turns out ambiguous or boring. If your microcopy isn’t compelling, it won’t inspire action. Customers are there for a reason, whether it’s to make a purchase or continue learning about your company’s products, so spell out action right in your copy. Microcopy isn’t an excuse to say just anything to make customers complete an action. The copy you present has to be relevant to your company brand and the intended action or it has no business being there at all. Customers want to engage with brands that make them feel heard and allow them to put trust in them. Create copy that does this, like InVision did. What’s the value that comes from microcopy? And who gets that value? Well, you do, of course. But so do your leads (if that wasn’t already obvious from everything we’ve told you about microcopy thus far). Since it’s pretty clear how good microcopy benefits your business, we’ll just cover that real quick. Good UX microcopy + leads = customers and high conversion rates. 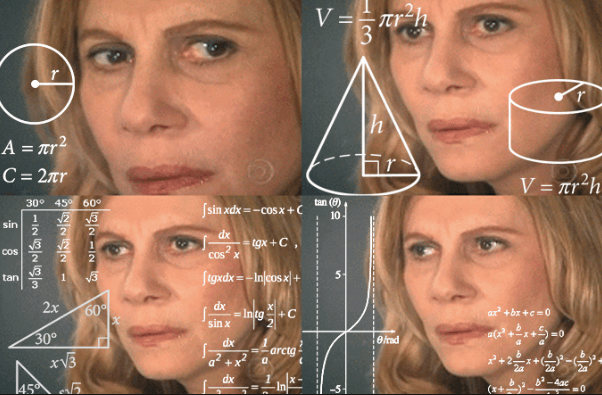 What you WON’T look like thinking about microcopy. But, how does it benefit your leads? Like the chorus of a song, we’ll sing it again. Their concerns are addressed. They complete an action. They reap the rewards of that action. AKA, their UX, or user experience, is a good one and they go from leads to customers. Once they become a customer, your product or your service is the value that is enhancing their life. Sometimes, good microcopy is all you need to give them that final nudge towards the finish line. Microcopy gives them that value by playing 3 different roles. Much like squirrels gathering nuts, customers like to gather as much information as possible. Microcopy provides them the “nuts” that they need to get from one step to the next, finally resulting in that action you want them to complete. So, what are the 3 roles microcopy plays to accomplish those actions? Writing microcopy as a Guide would include things like instructions to complete a purchase form or helpful notes explaining steps or necessary fields, and how that information will be used. Microcopy as a Promoter seeks to introduce product features and stimulate users to purchase. If it’s an old product, it might show how it’s been updated to suit customers even better than before. Comforter microcopy focuses on soothing customer frustrations, like encountering an Error 404 page. An error message with well-crafted microcopy will alleviate worries and reduce the frustration that might otherwise make them resent your business. So, you know what it is and why you need it. Now, time to write it! If you couldn’t already tell, we are big fans of microcopy. And it’s no secret that it benefits your business as well as your customer’s experience. So, now it’s time to start using it yourself! To get you started, we have some successful brand examples of places to use microcopy and how you might write it. That looks like a pretty compelling microcopy…time to sign up! There’s clear added-value from following through on the action. 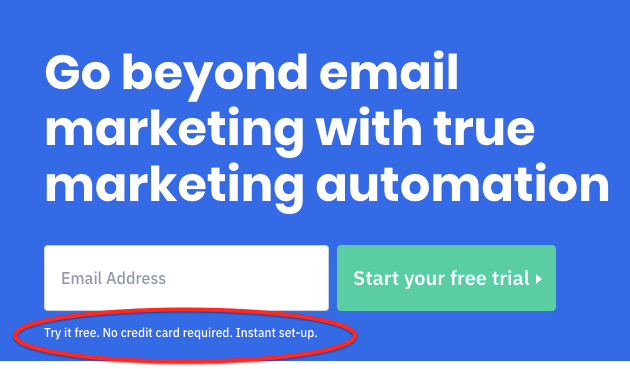 (The chance to try out free automation on TOP of email marketing? That’s the dream). The tone of the messaging is encouraging to customers, establishing trust. (Because no one would click through without some kind of foundation). 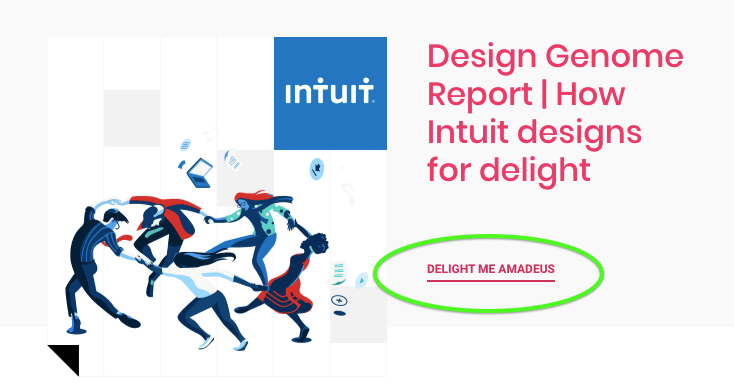 Forms are probably one of the most common places you’ll see microcopy because microcopy often accompanies a call-to-action button that completes said form. The language provides a clear, simple action for the customer to follow. (“Add to Chrome.” There are very few ways to do this wrong). Now that you know where you might see (and use) microcopy, here some more inspirational examples to follow as you create your own. Wow, that’s quite the razor. Not only does this Dollar Shave Club give helpful product feature information in their microcopy, but they also humanize it with a little humor. Pets, birthdays, last names. They’ve all been done before. With this helpful password instruction microcopy, nothing is off limits. You can use your imagination and create the most secure, hard-to-guess password in history. Thank you, microcopy. You don’t give your number to just anyone, and they won’t either. Forget that little nagging worry in the back of your mind as you fill out the fields of a purchase form. This microcopy from Modcloth assures the customer that the requested info will only be used for that purpose alone. Hola, great search bar microcopy! Have you ever gone to sites just to browse, not even knowing what you’re looking for, but you’re just doing it for fun? Personally, I’ve done this on Airbnb when I get the travel itch. 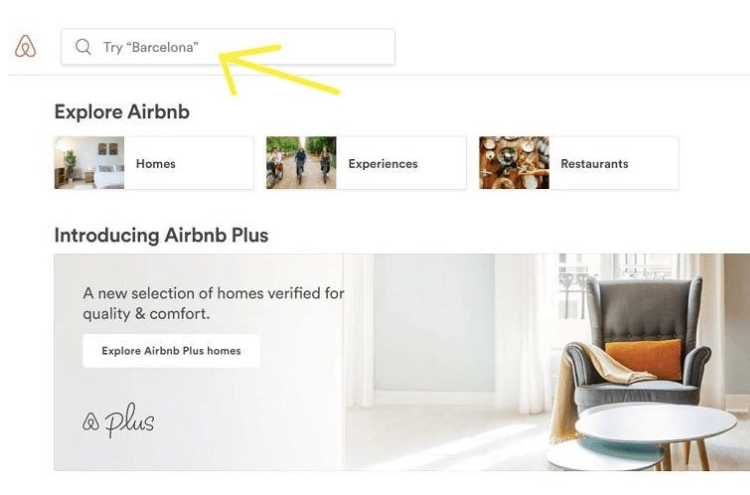 That’s why it’s so nice to have microcopy like theirs in the search bar (oohh, Barcelona…well I’m certainly clicking through now). Microcopy is famous for having the “small words make a big impact” reputation. We may hear it a lot, but it couldn’t be truer. Sometimes, less is more. Simple microcopy could mean the difference between a casual, occasional visiting lead and a permanent customer.